There is still time to register for this excellent 1st event of what the organizers of this summit plan will be many in our action steps toward understanding and equipping our community with tools to offer change in the way folks are connected to services surrounding the addiction and mental health providers and community resources. This first summit is focusing in on the heroine epidemic. It is a cancer that we must resolve ourselves to learn about together and establish better practices as a community on how we combat this terrible problem. This event should yield important collaboration, awareness, education, advocacy and a more unified community effort to move strategically as “A Community that Cares” to fight this epidemic. This event is not just a flavor of the month way to discuss the problems and then walk away with no plan. This event is not just a way for providers to find more ways to get funded and still the people who are slated to be helped never really do find a path out of the destruction…. THIS IS A SINCERE EFFORT as a core group of community leaders who have come together and leaned into one another and had sincere conversations about what it looks like to make changes in our community to work to a better end and to equip ourselves as a community to fight this epidemic. The crisis on the streets from our children, fiends and family who have been caught up in the heroine epidemic is real, the resources to help are not meeting capacity and also do not address the underlying conditions. We know the recycle of those who make it to detox and yet, not on to long term or successful rehabilitation is unacceptable.The truth that our neighbors who chose the path to use the very first time was a mistake, but at some point, studies have revealed — the brain is hijacked and the person we are praying for recovery is tucked behind an addiction who will lie, cheat and steel themselves to the death for this drug. There is no time to seek glory on who can fix this problem, WE ALL ARE IN THIS — WE ALL ARE CALLED — God will get the Glory! Come and equip yourself to be apart of the solution. We hope this event will be a group of like minded folks who are not coming to complain, not coming to blame but instead are coming to learn, lean in with one another and fill their tool box with something new they can use to join the fight and stand together with a Community who Cares! If you are a social worker, you should come. If you are a teacher, you should come. If you are a pastor, you should come. If you are involved in legislation or government, you should come. If you have experience this epidemic on a personal level, you should come. If you are a provider, you should come! Come ready to learn, collaborate, and visualize your place in the movement. There is limited space. Register today. Details below and attached. August 13th, 2016 from 10am to 3pm at Lifeway Church of God. Come out to this wonderful event. Full of fun and learning about organizations here working in our community! Click on the link above to learn more! 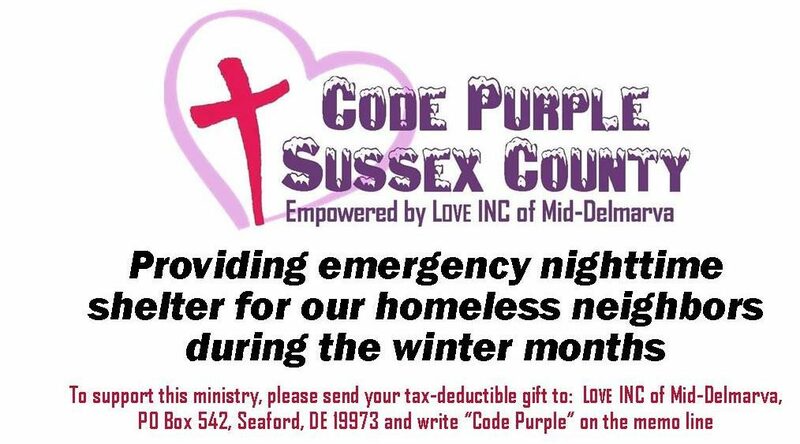 Code Purple Sussex County will be there!